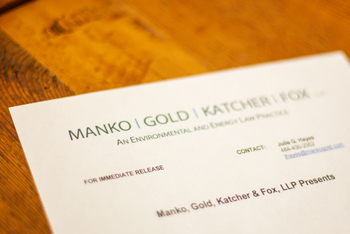 Philadelphia, PA (September 27, 2010) – Jonathan E. Rinde and Bridget L. Dorfman of Manko, Gold, Katcher & Fox, LLP will present at the Pennsylvania Bar Institute's late-breaking seminar on the Pennsylvania Department of Environmental Protection's Revised Chapter 102 Regulations: Erosion and Sediment control and Stormwater Management on October 8 at the PBI Professional Development Center in Pittsburgh. They will also be speaking when the same program is held on October 13 at the PBI Conference Center in Mechanicsburg, with a simulcast,and on October 15 at the CLE Conference Center in Philadelphia. Rinde and Dorfman will specifically present on the applicability and significance of the revised Chapter 102 regulations and also on stormwater compliance and enforcement, focusing on the role of County Conservation Districts, the role of the U.S. Environmental Protection Agency, and private rights of action. In Philadelphia, they will also be presenting on the recent changes tot he city's Stormwater Ordinance. This seminar will teach attorneys the basics of the entire stormwater regulatory program and will also keep attorneys up-to-date on the most current information in stormwater regulation.